Not again! But people do still keep getting caught out. If you have a good backup strategy then skip this article, otherwise read on. Backup or any form of security is all relative. There is no perfect system but the trick it to maximise your chances of not getting caught out. My way of doing this is a three front approach - data, email and system. Data is easy if you have an external USB hard disk and incremental backup software such as Syncback. E-mail always seems harder because I use Outlook Express and Microsoft doesn't make it easy, so I have two programmes which take care of this for me - BackRex Outlook Express Saver and EazyBackup. Both save e-mails, addresses and certain Windows settings. System files are more difficult. First of all, make frequent system restore settings in Programs>Accessories>System Tools>System Restore (I drag a shortcut onto my desktop to make finding this easier), and then do a whole disk clone using Acronis or Norton Ghost and a hard disk caddy (or open the bonnet and temporarily replace your CDROM with a spare hard disk). Security comes at a price, but ask anyone who's lost serious data and they will agree it's worth it. The price involves time, effort and money, but all hard disks crash in some unexpected way, sooner or later. Syncback comes from www.2brightsparks.com and there is a free basic version. Syncback will copy new and updated files from one drive to another, so typically you only have to copy/synchronise My Documents on drive C: with "My Documents" on your external USB drive E: or F: or whatever it happens to be when plugged in. Outlook and Outlook Express are a bit tricky so it's best to use a proprietary program to do this. Either BackRex from www.backsettings.com (I think there is a free demo basic version), or the more versatile EazyBackup from http://ajsystems.com/ezb.html . which isn't very expensive anyway. Again, direct your backup to a USB device. Make a shortcut to your desktop of System Restore and use it frequently. Finally make a whole disk clone from time to time. 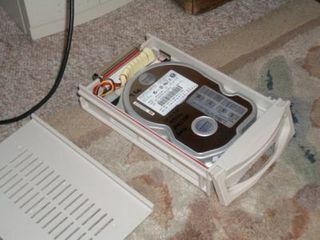 I did use Norton Ghost but find Acronis slower but more reliable, from www.acronis.com Either buy one or a pair of 5.25" caddies or simply substitute an IDE hard drive for your CDROM. (Don't know how you so easily do this with SATA). 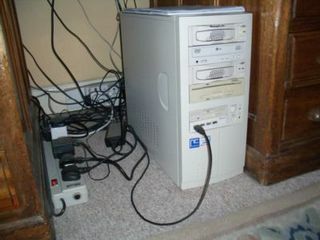 Spotmau also do data recovery and backup www.spotmau.com so worth a look. How much data can you afford to lose? A week's worth? A month's worth? Or the very document you've just spent all night preparing for the meeting first thing? And treasured photos? How frequently you back up depends on how much stuff you want to leave at risk.